Different Types of Dog Bite Injuries | Hupy and Abraham, S.C.
It’s too late to prevent the dog bite that left you or your child injured. Immediately after the dog bite, you know that your life has changed. You will have to deal with the injuries caused by the dog and you will have to figure out how to best protect your physical and financial recoveries so that the long-term impact of this painful incident is as small as possible. Injuries to your child. The consequences of a child’s dog bite injury can be life-long. Therefore, it is important to get your child immediate medical attention and to take steps to protect your child’s financial recovery. Facial injuries. A dog bite facial injury can be traumatic. Children are at particular risk of suffering these types of injuries; however, adults can also suffer injuries to the face after a dog bite. Infections, scarring, and injuries to specific senses such as sight and hearing should be discussed with your doctor. Infections. 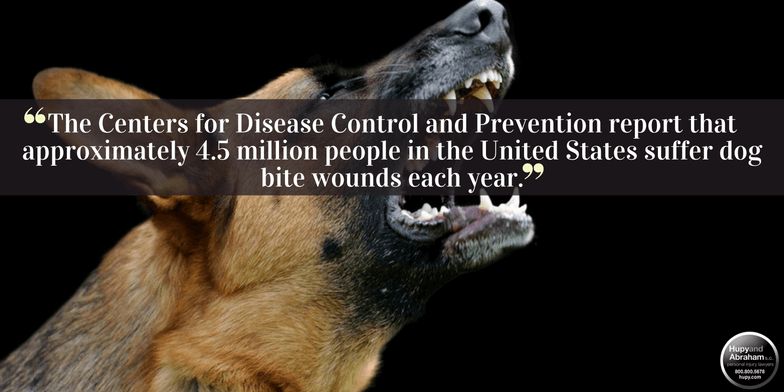 A dog bite infection can be life-threatening. If you develop a fever, redness around the wound, or any other symptom of an infection then you should see a doctor as soon as possible. Your doctor can diagnose the specific type of infection that you are suffering and prescribe the correct course of antibiotics to help you recover. Amputations. A dog bite can result in an amputation if the bite significantly injuries the bones, nerves, and tendons or if an untreatable infection develops at the wound site. A dog bite victim could lose an arm, hand, finger, leg, foot, or toe because of his injury. Scarring. Dog bite scars can be disfiguring, disabling and painful. Depending on the location of your scar and the damage that it is causing you, you might benefit from medical treatments such as skin grafts, dermabrasion surgery, or laser surgery. Nerve damage. A dog’s sharp teeth and powerful jaw can cause nerve damage for a dog bite victim. Nerve damage can range from temporary loss of function that resolves rather quickly to permanent damage including paralysis. Death. Excessive bleeding, infection, and other complications can be fatal after a dog bite. Sometimes, but not always, prompt medical attention can decrease the likelihood of a dog bite fatality. A dog bite fatality not only results in loss of life for the victim, but in significant emotional loss for the victim’s friends and family. It is important to work with the right medical doctors to diagnose and treat your injuries and to help prevent the injuries from worsening or becoming fatal. Once your injury has been diagnosed, then you can begin working with your doctor or medical team to create an appropriate treatment plan. This plan may begin immediately and may continue for months or years, depending on the unique injury that you suffer. Your medical bills may be significant, you may be unable to work, and you may incur other expenses while you recover from your injury. You shouldn’t have to pay for these damages if the dog that bitten you was not your own. Wisconsin law holds dog owners strictly liable for the injuries caused by their pets. You do not have to prove that the dog owner was negligent in his handling of his dog in order to recover damages. Instead, you need to prove who the dog owner was and the extent of your injuries. An experienced dog bite lawyer can help you do this and can help you get the recovery that you deserve through settlement negotiations or in court. Your time to file a claim is limited and you may suffer more with each day that goes by. Accordingly, we encourage you to contact us now. We are available to you 24/7 and we will help you protect your rights and make the fair recovery that you deserve. To learn more, please call us at 1-800-800-5678 or start a live chat with us now.